You got QuickBooks to manage your accounting because you knew it was time for some help. But QuickBooks only optimizes the backend of your operations. Smart Service security service software completes the picture by streamlining and enhancing the frontend. Because Smart Service is a QuickBooks add-on, all information that you have in QuickBooks is reflected in Smart Service. Job history, current routes, and customer management are a breeze and you never have to worry about double entering data. Smart Service does it all for you. You chose QuickBooks for its easy interface and technical capabilities. Smart Service is the logical next step for the same reasons! Running a small business is full of little details that need attention, double-entering data and scanning forms shouldn’t be among them. Smart Service-QuickBooks integration means that any new information entered in Smart Service is automatically synced into QuickBooks for optimum efficiency. And digital forms with our mobile service app do the same thing! You’ll never have to worry about gaps in information, scheduling, or job details. QuickBooks and Smart Service security service software are really the perfect pair. Linking Smart Service and QuickBooks and importing all your existing data means nothing gets lost in translation. With the way that Smart Service integrates, all customer information, job history, routing, and notes become a part of your security service software. 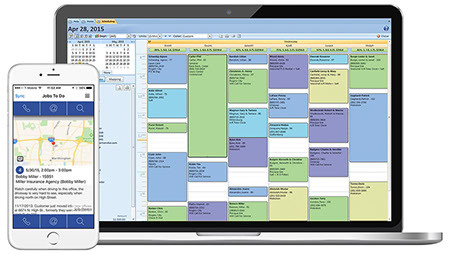 With our easy-to-use scheduling interface, creating a new job is simple. Just start typing a customer name and Smart Service does the rest, filing in information you’ve already stored. Once the job is created it’s as easy as clicking and dragging to choose a tech. Add job notes or any additional information, and then you can send it straight to your field team with the Smart Service mobile app. And all of this information is reflected in QuickBooks! You end up storing a lot of information about jobs, employees, customers, and billing. It’s the nature of the beast. But unless organization is your middle name, this has the potential to cause a headache every time you need to find that one specific something. Smart Service security service software operates like a one-stop shop for all your customer information needs. Every note you’ve made, customer you’ve recorded, and job you’ve finished is intertwined with QuickBooks and easily accessible. You can even send relevant information to technicians in the field with our mobile app. Your field teams can call or email your customers to let them know you’re on your way, or collect signatures in the field to send back to the office. Customer management is easier than ever with the Smart Service software solution. Smart Service makes sure you have everything you need to keep your business running. Request a free demo of our security service software for QuickBooks! Find new ways to better your business with these articles!